Many legends and rumors existing among the edged weapon collectors community that enable crooked dealers to earn large sums of money from the trusting and gullible.. In this case I define a sucker is a collector who prefers to give credence to dealer`s assertions rather than spending money on informative books. This failing concerns both enthusiasts searching for cheap originals and the nouveau riche who can easily spend thousands of dollars for a rarity. Moreover, the latter pay not for an item itself, but for a stunning certificate of authenticity which is, in point of fact, nothing more than a piece of paper. Some of these gullible suckers are convinced that the self-proclaimed experts are careful of their professional reputation and do not want to be identified as dealing in fraudulent items. The reason why the swindlers prefer to trade in antiques is that statements of authenticity are difficult to challenge and often hard to disprove! It is not like a chemical analysis of low-quality drugs. It is impossible to take a sample and to kill a rascal afterwards. The antique-trade is much complicated and easier at the same time. Though, some proceeds can be compared with small consignment of drugs. That is why dealers become impudent in fabricating unique items and trumping up modifications. The era of internet made people ignorant; everybody would rather look at images than read, and processed imagery seems to them more convincing than a paragraph of authoritative text. As O. Henry said: “A farmer will be a farmer”. In our hobby it is the same: a sucker will be a sucker. Let`s return to our fraudster roast. As I have already written, having both created and authenticated fakes, James Atwood (and his successors) secured not only his own financial well-being but of a small army of fraud merchants who are still repeating his legends and using his fakesfor their gain and the collecting world’s loss. Let`s have a look at one of the most known and disputable daggers. This newsletter will be devoted solely to this dagger. First of all, this item is costly; dealers` prices range from 40K to 100K dollars. Secondly, dealers abound with post-war created “proofs” not only for fantasy pieces of Atwood`s origin but those of others in the trade. 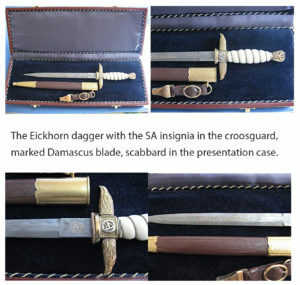 Thirdly, these daggers are offered for sale by top-dealers, who should be the first to take care of their own reputation and to prevent discrediting of their names and professional reputations. Finally, this dagger is still being featured in many current purported reference books and publications on edged weapon of the German Third Reich. Consider that Atwood described in his book a purported ‘Special SA Presentation Dagger’ for SA leaders. The first thing any responsible collector should question is the somewhat bizarre listing of awardees. After the first edition of Atwood’s book appeared, this dagger was included in nearly all of the books on German edged weapons. Images of the Atwood production dagger, supported by lightweight comments and weaker allegations appeared in book after book. While some authors included it out of sheer ignorance; others were delighted with the idea of obtaining a copy and merchandising it to trusting readers of their books. A page from the album that was allegedly found in the original Eickhorn factory files and this “discovery” was created to add weight to the dagger’s authenticity. This page displays the image of this unique dagger and contains information on recipients written in Gothic characters. The list of names is not long and it consists of only 4 names plus the words “and others.” These names are: Knickmann (Standarte-53 Gruppenführer der Nordmarkgruppe), Hühnlein (NSKK-Obergruppenführer), Dr. Ley and Schumann (DAF-Führer). Everything seems to point to solid evidence that would effectively silence all skeptics. 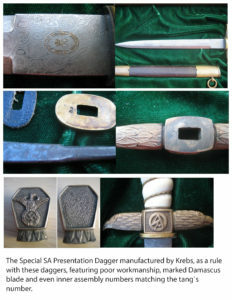 Sometimes ago it was commonly believed that an alleged article in the SA magazine “Der SA-Mann” on the Honor Dagger for the SA leaders М37 proved these unique daggers to be original. Unfortunately there is not even a single piece of period evidence to show this dagger in wear or an official announcement of its presentation. While several of the alleged awardees had been regularly photographed and could be seen wearing other rare daggers, this particular one was never seen in period print. The same may be said for the DAF officials that were mentioned in that issue. 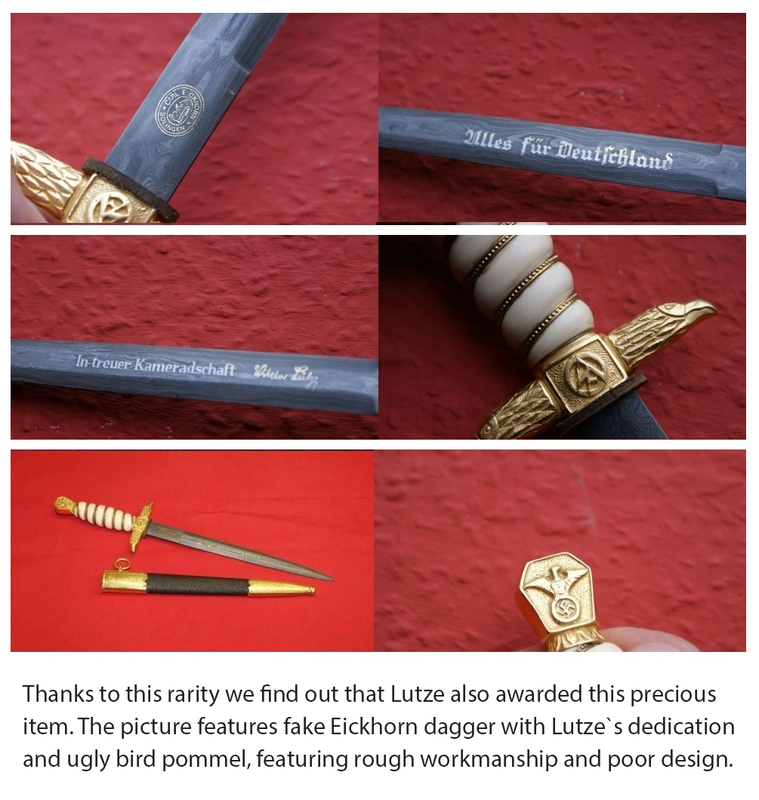 The list of named recipients plus “and others” suggests that a number of these daggers was awarded. But there is no period evidence to support either the existence or issue of this fantasy piece. Interestingly enough, the alleged catalog page has no markings and merely has an artist’s rendering of the Atwood creation. 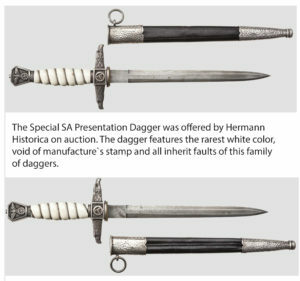 Since this dagger never existed during the course of the Third Reich, it is obvious that an alleged official catalog picture could never have existed. This is obviously a fake designed to authenticate a fantasy piece The blade features the name of the fifth recipient – Vetter. 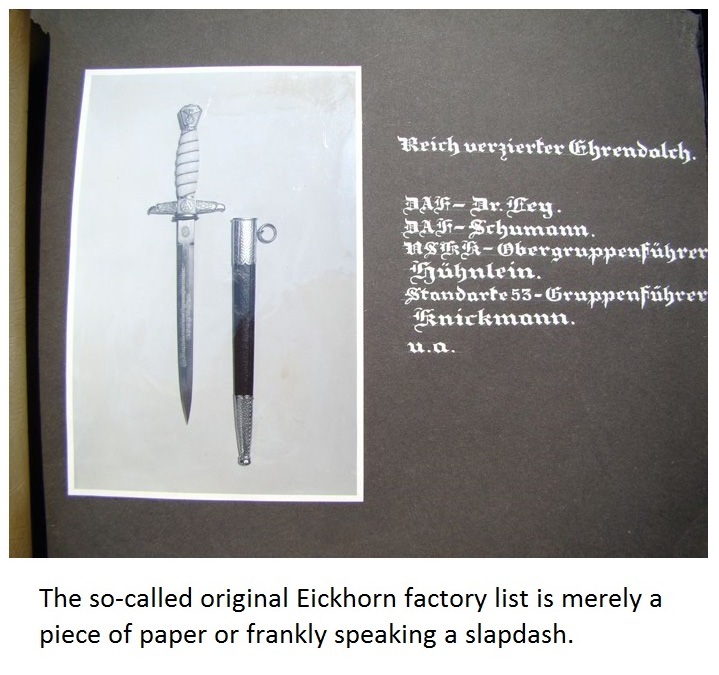 The so-called original Eickhorn factory page does not even correctly identify the dagger: “Reich ornate Honor dagger” – rather odd than the formal title for the dagger. The catalogue of the company and other special-purpose publications like “Uniformenmarkt”, “Der SA-Mann” or “Der Klinge” do not even mention such a dagger. 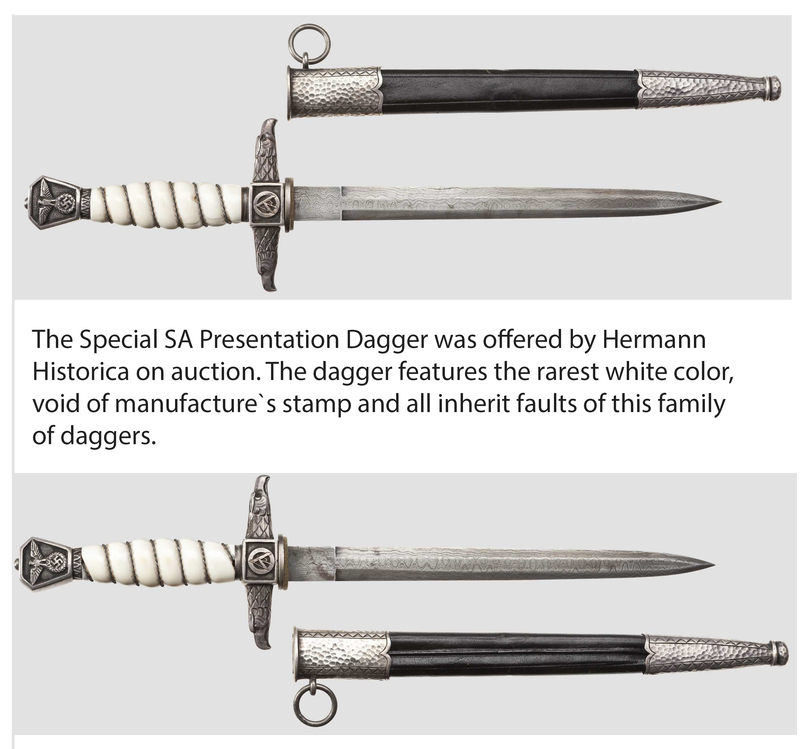 The article used for referencing purposes is void of any image and describes another dagger that is wrongly named the Feldherrnhalle dagger. Following the death of Colonel Atwood,one of his fantasy piece replicas surfaced in the hands of the well-known Craig Gottlieb and also with the German dealer, Helmuth Weitze. Both of them have dealt in these daggers, and moreover they have even the pattern for the NSBO. In late 2011 Gottleib sold such a dagger, colored in white, for 70K. 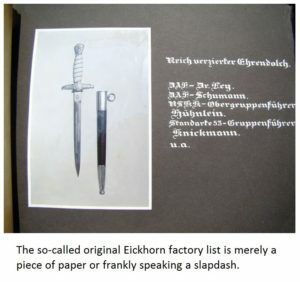 Mr. Gottlieb’s dagger didn`t even have the purported maker’s trademark, but he assured potential buyers that it was made by Eickhorn! It should be noted, that when it was subsequently returned by the purchaser, Gottlieb dropped the price to only 45 thousand dollars. A true investment in history for the discriminating collector. 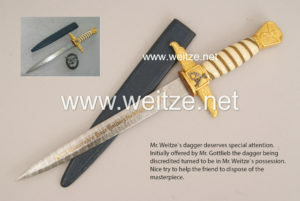 But this dagger is still available from Weitze, so, other discriminating collectors can still impress their friends. Weitze does not disclose the price to the public. 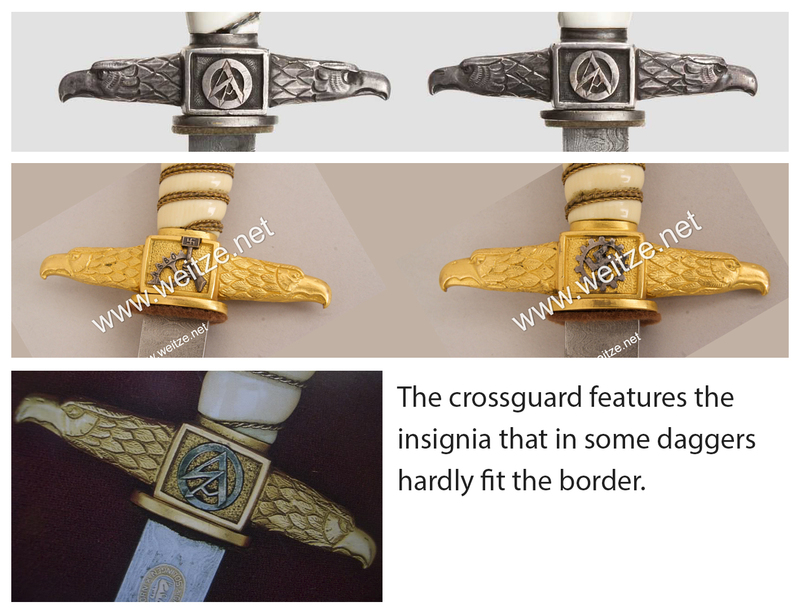 So, let`s have a closer look at the dagger in question. I`m not going to present myself as a pioneer in this field. The detailed discussion ranging from fantasy stories about the veteran who brought the dagger to Craig to technical peculiarities and childish rants one can find in scrolling through WAF is too prolix, and too bizarre to repeat in detail but I will highlight major points. The fantasy dagger displays a great deal of hand work that is unusual for a Third Reich dagger manufacturer. The Eickhorn company was large enough for hand-made production to occur, even if it concerned an order of 100 items. Very short production runs allowed a maker to assemble a dagger from parts in stock if he was reluctant to create new parts. The workmanship quality of this dagger provokes laughter from any serious collector. It is definitely difficult to gain absolute symmetry in a hand-made production. But any craftsman would be supposed to do his work proficiently, taking into account the purported importance of the dagger. What can we observe in thispiece? 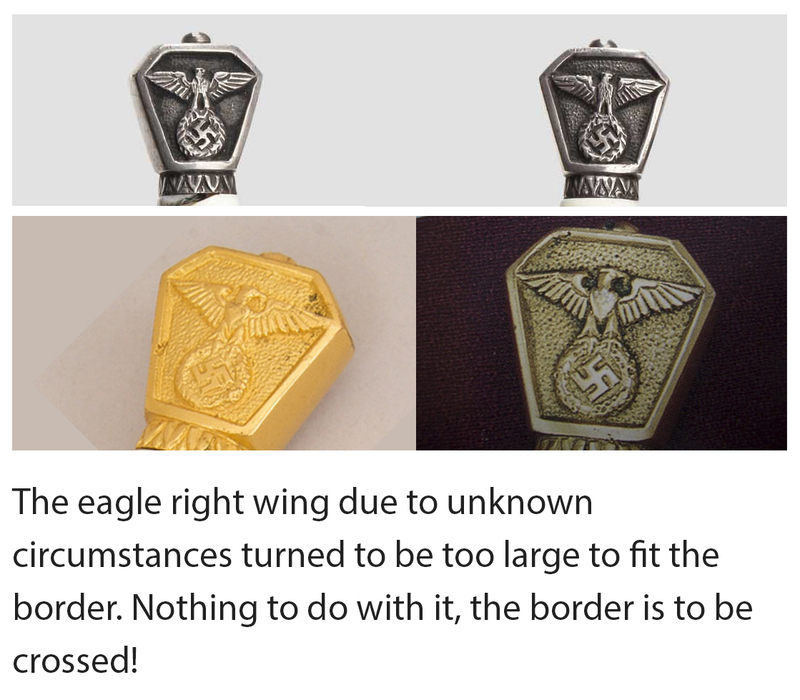 The pommel is in the form of an eagle but has different wings. The right wing crosses the border area and it doesn’t fit properly. The center of the guard had a place for the SA, NSBO or other unit insignia. But it dosn`t fit this area properly. The cross guard featuring the two eagle heads does not hold water as well. Carl Eickhorn and his staff, including his designers, would be horrified looking at this badly constructed abortion which was being credited to their establishment. The blade is indeed genuine Damascus and often bears different dedications, but unfortunately, these are forgeries. Many craftsmen of Solingen after the war resorted to any kind of work in their field to provide their families with food. But the most significant indicator of the acceptance of this fraud was that this fake was duplicated by a number of petty crooks. As a result, we can enjoy these daggers with cut out and epoxied in SA insignias, or daggers allegedly manufactured by Krebs. I know a rich and foolish collector who paid cubic money for one of these fakes. I just rang him up and told him about your posting. He went basllistic and screamed that his piece has been authenticated by “real experts” on the WAF and that your site was run by crazy and evil people and that it should never, ever, be looked at. I told him that he might be right but that as of right now, his dagger, the one in the special case, was worth nothing. More screaming and he hung up on me. Your man ruined his dream! If you think that the two von Johnston articles are dream destroyers, wait until you see what else he has covered. As far as your hysterical collector is concerned, his response is typical. And when you say that his fake dagger is now worthless, you are right. I know of at least ten of these, some original Atwood fakes and some pathetic recent copies. Atwood showed me pictures of all of this crap when I knew him in Germany. He laughed and said the original design for the “Birdshead Dagger” came from a proposed design for a German hunting association piece that never was made. I wouldn’t suggest walking under that bird, sir, because it might drop something nasty on your head!